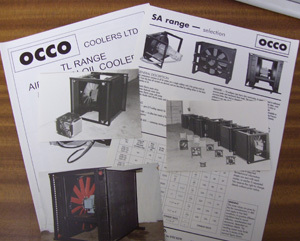 Over the years the Occo range has produced many types of air blast oil and water coolers. During that time we have updated and improved on earlier versions, or demand for a particular cooler may have dwindled in the face of changing industry. From time to time we may be asked to provide spare parts for or complete replacement coolers that are no longer part of our range. Most of our discontinued builds have been preserved and as long as the components are still available we should still be able to produce many of ranges no longer made as standard.